I’ve been writing for most of my life. It was hard not to. It was part of my job as an accountant to write reports, letters and other forms of communication. So learning to write fiction shouldn’t have been that difficult, should it? But of course it was. Business writing is about communicating facts and opinions. It’s the part that appeals to the logical side of our brains. Writing fiction is quite different. It is a creative process — painting with words and engaging the emotions of the reader. I had a lot learn! First the easy part: the dialogue conventions and techniques. Rule 1 : Each change of speaker should be a new paragraph. That way it is easy to understand when someone else is speaking. Rule 2: Dialogue tags should be limited to a bare minimum to understand who is speaking. By tag, I mean ‘John said’, ‘he said’, or ‘she said’ etc. If it is obvious who’s speaking, no tag is necessary. Rule 3; Avoid emotive tags, such “I’ll kill you,” he threatened. It’s pretty obvious that the speaker is threatening and it adds nothing. Similarly avoid the use of adverbs in tags such as ‘he said cynically’. Again the cynicism should be obvious from the text. In practice, ‘said’ is probably the easiest tag to use as it is relatively invisible to the reader. Rule 4: Where there is an ‘action beat’ before the dialogue, the speaker is presumed to be the same. For example: John turned towards Mary. “Get out of my sight.” Here it is presumed that John is the speaker and so no tag is necessary. Rule 5: Don’t use dialogue as an information dump to inform the reader. For example: “As you know, John. We’ve both suspect the butler is the killer.” This type of information dump just sounds awful. Rule 6: Don’t mimic small talk about the weather, their health or anything else that isn’t relevant to the story line. 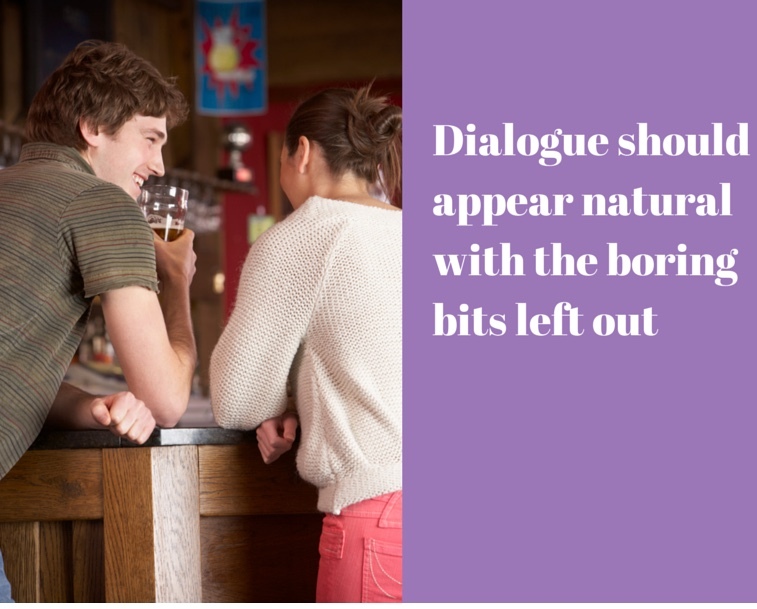 Dialogue should appear natural, but shouldn’t mimic all the distracting features of natural speech. Rule 7: Dialogue is a form of action. There should be elements of tension and sub text in the exchanges. Not answering questions, or answering a question with another question can raise interest in the readers mind as to why the speaker is being evasive. Those are probably the basic rules you need to understand, but it is only the start. There is a real skill is crafting good dialogue. I tend to write my dialogue quickly by listening to the characters in my head. (Yes I hear voices). Then edit, edit and edit again. My own experience is that I tend to edit dialogue more than any other part of my writing. It’s only when it feels natural and real that I am satisfied.